Beauty alters me, once more. Sort of lost in thought right now. I’m amazed at people. We meet each other as we travel down our individual paths, our individual direction. Sometime we are together for a while, sometimes we meet on occasion and sometimes maybe only once. But we observe each other and come away with a message. 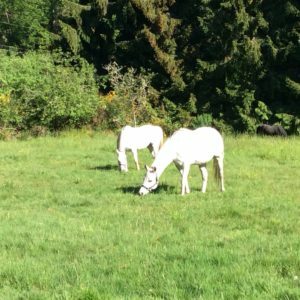 I am noticing how some folks seem to move forward down the trail seemingly fearing everything that comes up or might possibly come up. What a burden that must be. Although perhaps it is not everything that they fear. Maybe there are areas that they feel comfortable in, I don’t know. And then there are other individuals that I marvel at that move through the environment with such ease, seemly fearing nothing. They are aways ready for the next thing no matter what that might be. I’m inspired by them. Felipe with logbook. Getting history down on paper. Somehow with the holiday today and all going on I lost track of the fact that there was a regular scheduled walk this AM at 0900. At 0830 I saw Dana’s email, “walk?”. And of course I answered it, “yes, of course”. See how it works? People think that I get people to walk but part of the time they get me going and motivated to get out there. And out there is just beautiful right now. Paradise switch on, there is not a cloud in the sky. Exactly the right temperature, whatever it may be. It’s Memorial Day today here in the States, time to reflect and honor our war dead. I’m participating by helping to put up flags in town. And some folks are coming out from the city to walk and have tapas in a little bit. Just kind of a Norman Rockwell kind of day. 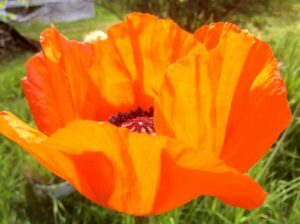 These beautiful poppies aways arrive in time for Memorial Day helping us to remember our war dead. We have been walking at the ranch and we are at the town of Calzadilla de los Hermanillos, a little west of Sahagun. Sahagun is the town that pilgrims think of as half way. So, the trail is in good shape with a dry surface and the grass is all mowed. Rebecca and Catalina at Raven Ranch. Just taking a little break at the moment. Catalina is here to be with us for the weekend from Berkley, CA. 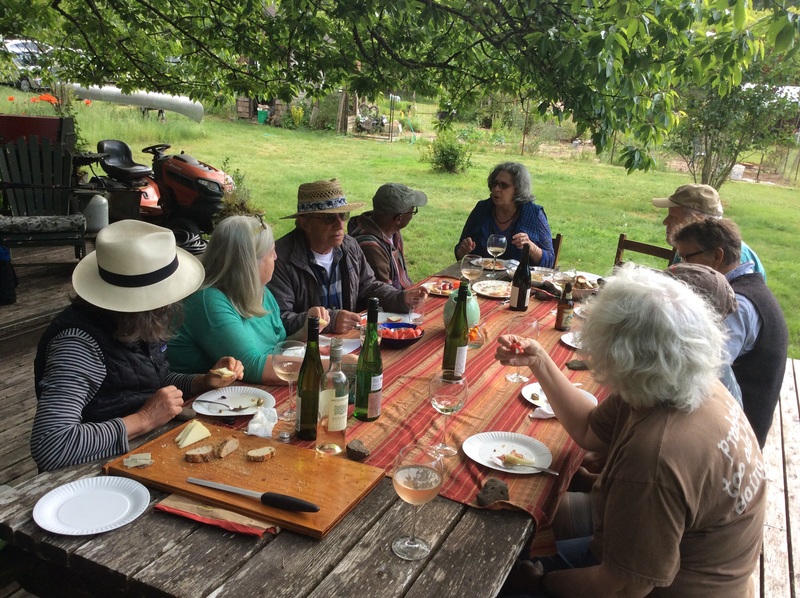 We are working together to get down to the essence of Phil’s Camino – the trail, the experience, the substitute for the real thing. 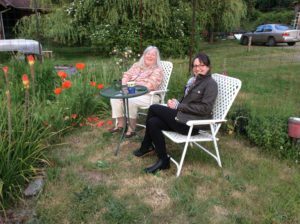 She is a prof and art historian and her special interest is in labyrinths and shrines that people,and groups have built to serve as replicas of the real thing. The idea is to try to have a similar experience to the real thing if a person can’t make the trip. So, she came to the right place, right? We got that stuff going on and it has been working for a while. It is fun to see her come and check the scene out. With her knowledge and experience she is looking it over. It’s fun to help her out. A Saturday in the Pyrenees means that I am having low energy due to the normal cycle of my chemotherapy. So, I am resting and writing and working with Catalina. Right at the hospital to get my pump Pancho taken off and then I will be on the road to the airport to pick up Catalina. She will be with us a the ranch for a few days to check out Phil’s Camino close up. This is something that I have really been looking forward to. We both as it turns out grew up in Western New York so we will have plenty to talk about starting way back there. Sun is finally coming out around here so am looking forward to some walks today and over the weekend. We are supposed to be doing an interview but that could take many forms. We will see what Catalina has in mind. Starting to think about getting ready for the trip to San Francisco next weekend. Will see some old friends, Annie, Padre Tomas and new friends that will be there for the film. OK, back home at Raven Ranch. Have Catalina safely here from the airport. Just had a chicken dinner and fruit salad dessert. Right now listening to Buffalo Springfield album that we haven’t played in twenty years. 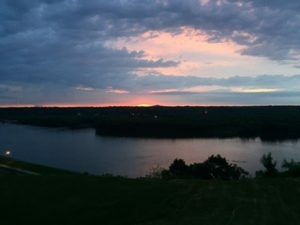 Kathy from Dubuque just sent this in, sunrise on the Mississippi. Have a walk at 0900 and will check out the corn progress. So exciting to start a new season. Need to find some time to finish the sunflower planting. There were a bunch of volunteer sunflowers that were coming up all over the cornfield so Ivette and I transplanted those to into a row but still have some seeds to plant. Sunflowers are so fun. Ivette was saying that in Italian they are known as flowers that turn with the sun. Yea, like that. Still pretty much celebrating my good scan results. This gives me a good shot at three carefree months till the next one. That’s the name of the game right now, living from scan to scan and having fun betwixt and between. So, party on around here. We will, God willing, be eating super fresh corn on the cob and enjoying the crazy robust sunflower blooms when my next scan needs doing. Alperfect, right? Today off working building a retaining wall for a little slope that is unruly. Rene, the Mexican gardener will help. Then am building a little wooden console that fits in a neighbors new car and that needs a fitting to see how close I came to a fit with my educated guess. That’s Thursday and then tomorrow will run into the hospital for an hour and then off to SeaTac airport to pick up Catalina coming in from California. Oh, time to walk, have to go, later, love all the time, Felipe. Hi. I’m at the hospital and just about done with my chemo treatment. Ivette, my old friend was here with me for most of the time and we gabbed about old times. Had the conference with my chemo doc about my scan results and things are still good! There was very very slight growth in my tumors so usual treatment will continue. Nice. So, had tapas at two places this afternoon to celebrate. So, at this point would like to thank you all for thinking of me and praying for me. As you can see we are keeping one step ahead of things. Good deal all around. I gave my tumors a little pep talk this AM. I have a scan today at the Cancer Institute and I told them that they were going to be on camera and they need to look their best. We are working on things together these days, trying to work out solutions. Will be packing up shortly for the drive in to Seattle. So just wanted to touch base with you before I have to set the iPad down. Hope everything is going well there. Just heard through the grapevine that the Starbucks located by the Cancer Institute is merging with one further down the avenue. Hundreds of nurses and doctors got their caffeine from this little cafe, well they did until last Friday. Will this be some kind of glitch in my care? Always something. OK, off to the ferry. Later, love, Felipe. OK, Monday morn. Where are we going to go today? Something that Annie said in the last post stuck me as something really significant. Looks like a good topic for today. Maybe grab another coffee. I remember coming back from Spain and everyone and their brother wanting to know how it went. That ‘s great really. They were interested. What was frustrating for me and probably for you was most of those folks were interested in the twenty five word or less answer. Here I was, here we were, after having our minds completely blown having to put that experience into words much less twenty five or less. Not really possible without months of processing. Yes, but now I could come up with maybe numerous short answers to that question. How about, “Yea, it is an international spiritual boot camp and I just got back from that and I feel totally beat up, best thing I ever did! OK, that’s twenty six words but it’s pretty good. Oh look it’s 0908 and I am late for my walk. Later, love, Felipe. I did a pretty thorough update last week, so I will keep this short and sweet. June 2, 9:30 PM in Hermosa Beach as part of the South Bay Film and Music Festival. 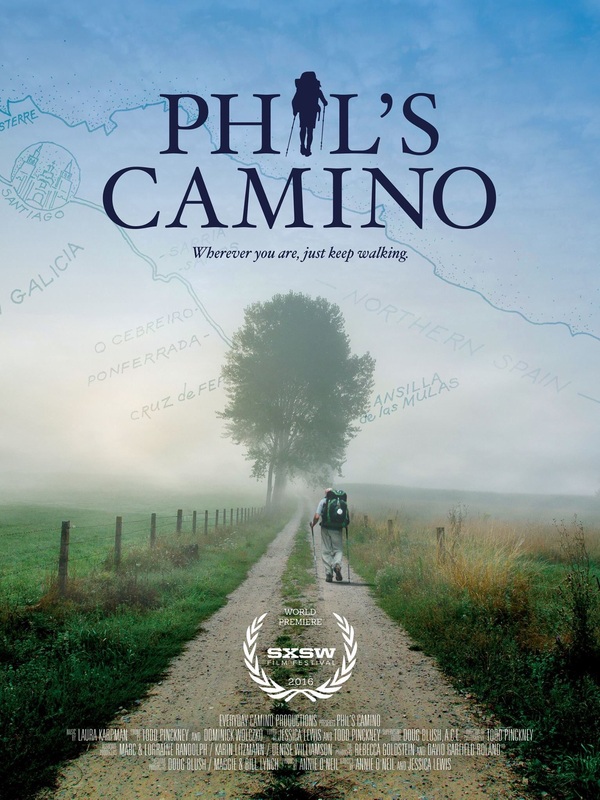 June 4 2:15 PM & June 6 at 7:00 PM in San Francisco as part of SF DOCFest ***The man himself, Phil, will be in attendance, along with yours truly (Annie) as well as one of our Spiritual Advisors of Phil’s Camino, Fr. 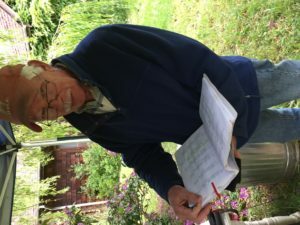 Tom Hall. There is one more, but I *still* cannot announce it yet. Stay tuned. It is in June. I know that so many of you Caminoheads have already made generous donations to what I think of as the Phil’s Camino movement. I do believe this is a movement, Dear Ones. 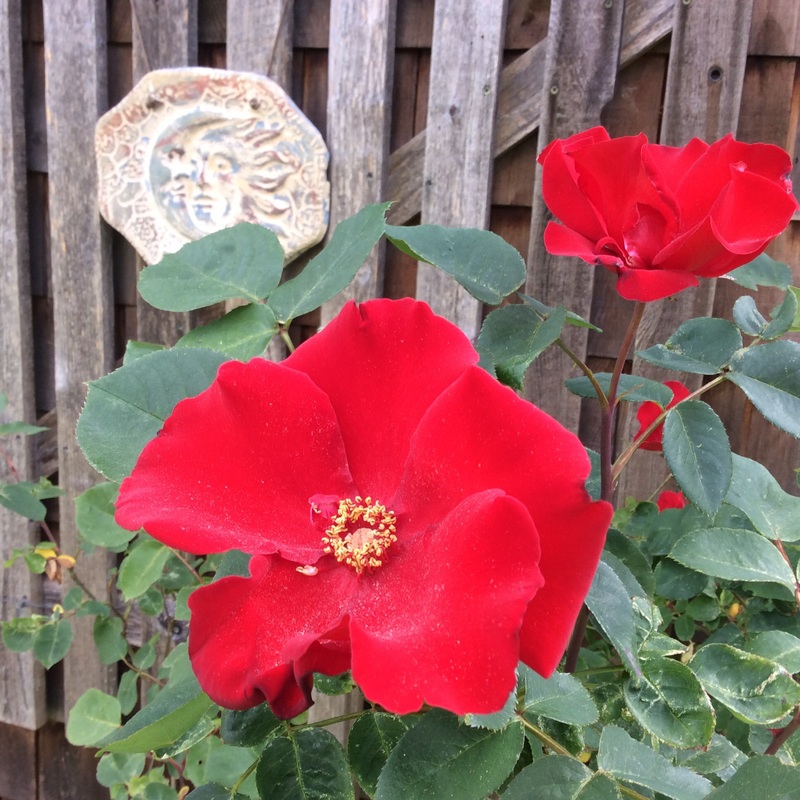 From the moment I heard about Phil and his backyard Camino I felt such a kinship: I was finishing my book that is all about making every day sacred, and everywhere you walk a part of your Camino. I had felt so strongly when I returned from my Camino that when folks would ask me ‘How was your Camino?’ that they were using the wrong tense: it wasn’t in the past! It was happening now! Right now, as we talked together! They were, in fact, part of my Camino! So for me, being able to tell Phil’s story in film, and share it with more and more people, is a huge honor, and is perhaps the best thing I have ever given to my fellow human beings. This film touches people’s hearts, and that is the height of filmmaking, don’t you think? 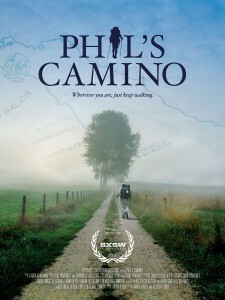 If you would like to donate, you can do so at our Phil’s Camino website, www.philscamino.com Some folks make large donations, some folks make small donations, but it all helps us get this film out to more and more people. Thank you. Lastly, I know that so many of you keep us in your prayers. Thank you. That is the only way that I can explain how this film even got made in the first place. I joke and say that St. James is one of our Executive Producers, but really that is only half a joke. I think that this film is something that powers greater than I wanted to get made. I am the humble servant here, and I try and just keep open to what I am called to do. Right now it is getting this film to festivals, then out to the world. I will offer you the same invitation Phil gave me when we met: Come walk with me.